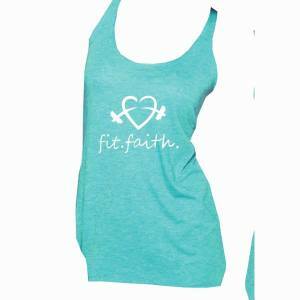 Next level tri-blend workout tank. Designed to remind you of your beauty and strength. Will have people asking you how you stay motivated — “faith!” Available in sizes Small – XLarge. Color: Tahiti Blue with white logo. Shipping/Returns: All sales final. Shipping to United States flat rate $2.99. NC state tax included. International shipping requires additional shipping and handling. Please add $18 to order for international shipping. (HI/AK have special rates, please contact for details). Use contact form if there are any problems with ordering. If item becomes out of stock, you will be notified of estimated shipping date. Thank you for your order!